Figure 4.1. Binding node operations: set_bind events control whether bindable nodes go to the top of the stack or pop off the stack. Figure 4.2. A variety of viewpoints are available in the Kelp Forest Exhibit, some of them moving with the tank inhabitants. 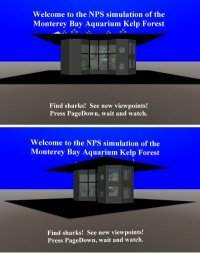 Locations shown in the figure include the initial view, roof top, Lefty the shark, Nancy the diver, and various animals of interest. Figure 4.3. 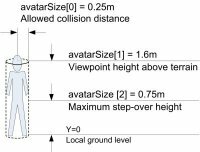 NavigationInfo avatarSize is a three-element array describing allowed camera-to-object collision distance default, Viewpoint height above ground, and maximum stepover height for colliding geometry when in WALK mode. Figure 4.4. 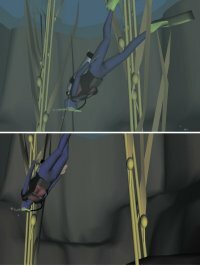 Two views of the Kelp Forest Exhibit scene demonstrate how Billboard-rotated text remains facing the user. Figure 4.5. Example screen shots first show the viewer being stopped by glass geometry, then the viewer passing through the tank glass for a closer view. Collision enabled="true" or enabled="false" result in different navigation response.